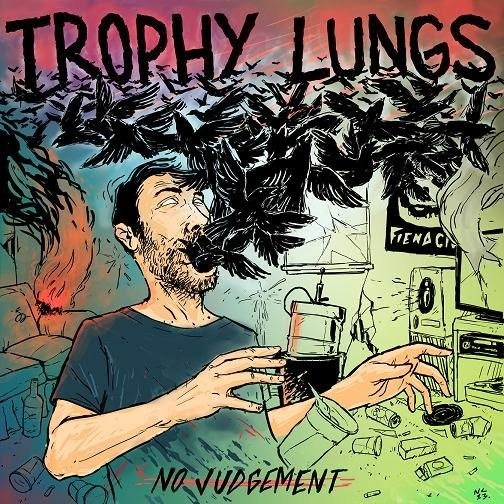 Boston pop punk trio, Trophy Lungs, will release the anticipated No Judgement 7" (Death to False Hope Records and Drink or Die Records) on November 29th. Earlier this year the band contributed to the This Is New England – A 100% Benefit Compilation, opened for Masked Intruder at the Middle East in Cambridge and most recently toured the East Coast promoting their new record. As a consistent presence in the Boston punk community (these guys are everywhere), Trophy Lungs continue to refine their sound. In true punk fashion, “Left of Center” opens with an ambiguous sound clip before breaking into the pop punk style Trophy Lungs is known for. I attribute a lot of my fondness for this 7” to bassist Kelly McGuire’s vocals on “Dad’s Away on Business” and guitarist Kevin Bogart's Big D reference, "When 28 bucks is all you got". Although this 3-song sample is primarily one note, Trophy Lungs manages to do it well. You can catch them live and in action during their Record Release Show at O’Brien’s Pub in Allston on November 30th alongside The Offseason, Rebuilder and Weak Week. Follow Trophy Lungs on Facebook and Twitter for additional show dates. No Judgement will be available for purchase on the band's online merch store on November 29th.